This sparkling newcomer builds on the spectacular success of the Crystal. You’ll revel in more comfort, more luxury with tempting extras like the stainless steel 3-burner hob and grill; Full mains electrics; TV point; Awning light; Choice of cotton or velour furnishings; Side and end roof lockers; British made Electrolux refrigerator - Fitted as standard on all Fleetwood caravans because only the best is good enough for us … and you. We do not have access to the Sales Literature for these years. If you have any information and would be prepared to share it with the Club, please contact the Webmaster. The good looking Garland. Smooth, sleek exterior. Comfortable tasteful interior. New this year is a spacious end bathroom layout which complements the existing range of two, four and five berth models. Enjoy all the comforts of home, in a Garland, in Fleetwood Country. 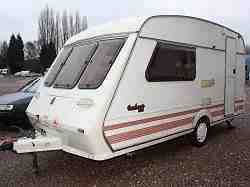 The model range was the same as in 1991 with the addition of the Garland 185 a twin-axle model - New. Exciting new layouts are lavishly equipped with clever ideas and useful features. Fleetwood dropped the smallest model, the Garland 114-2, and added a Garland 164-4 – New. 1994 Spoil yourself with great choice in a Garland. So popular and so much in demand. The highly desirable Garland sets new standards in imaginative styling and attention to detail. An increased choice of spacious layouts, extra specifications and extra equipment must surely make the Garland the caravan to go for in ’94. The only change to the range is that the Garland 148-4 becomes Garland 148-4EK – New. High in comfort features, high in practical benefits, highly successful and highly desirable. The addition of an end-bathroom twin-axle is the only change this year -Garland 185-EB – New. More space, more comfort and more practical layouts to suit your family lifestyle. Since the launch of the Garland in 1988, this range has become recognised for its distinctive model style, comprehensive specification and unequalled value for money. Fleetwood have now added to this unique appeal a touch of refinement and luxury which, for 1997, places Garland in that position in the market which appeals to the discerning and demanding buyer, whilst retaining its traditional affordability. The Garland 165-EB and Garland 165-EK give two new distinctive layouts equally adaptable for two berth or family use.